Adding to my saga of things breaking down, we had a blow out in my van last week. It was pretty intense. The headlight blew out of the car. The fender was knocked off by the tire tread. The front driver's side panel has the same appearance as though we hit a deer. The a.c. was knocked out. We were okay though. I feel as though God had his hand on us. Denbigh was able to maintain complete control of the car. Our girls never got upset even though they were hot and it appeared we were stranded. Our car was still driveable. We made it to camp for Denbigh to lead worship with literal minutes to spare. 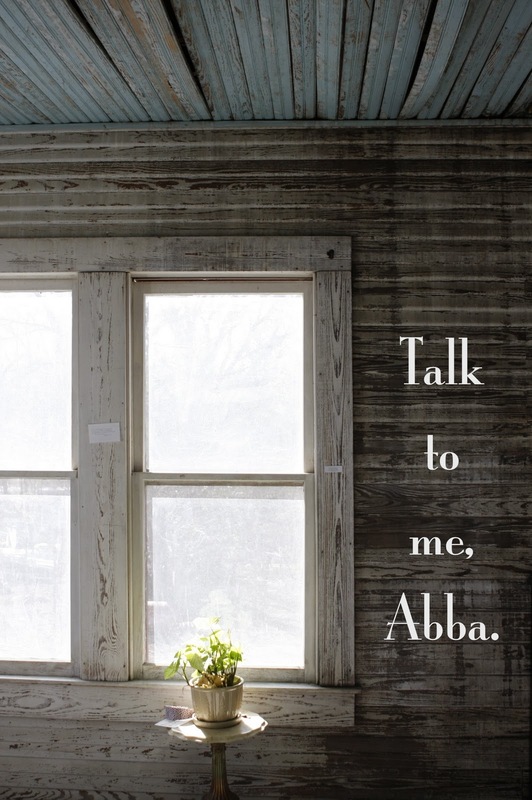 As we were coming in to downtown Huntsville, I wanted to hear from my Abba. 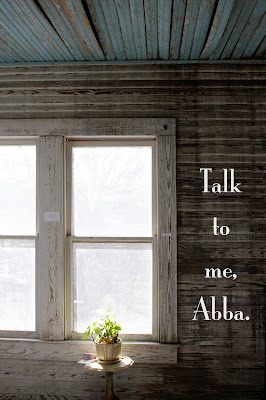 I needed to talk to him and hand another thing into his hand. I put my face into my hands and repeatedly whispered, "Kyrie eleison. Christe eleison." (Lord, have mercy. Christ, have mercy). I looked up to see a rainbow far ahead of us. I started shouting about the rainbow. I had to shout because the wind was whipping in the windows. I was also excited thinking about God's promises and his ability to keep them. 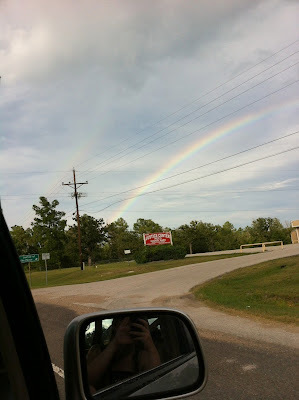 As we drove closer and closer to our destination, the rainbow began to fill the sky. It became two. A double rainbow. 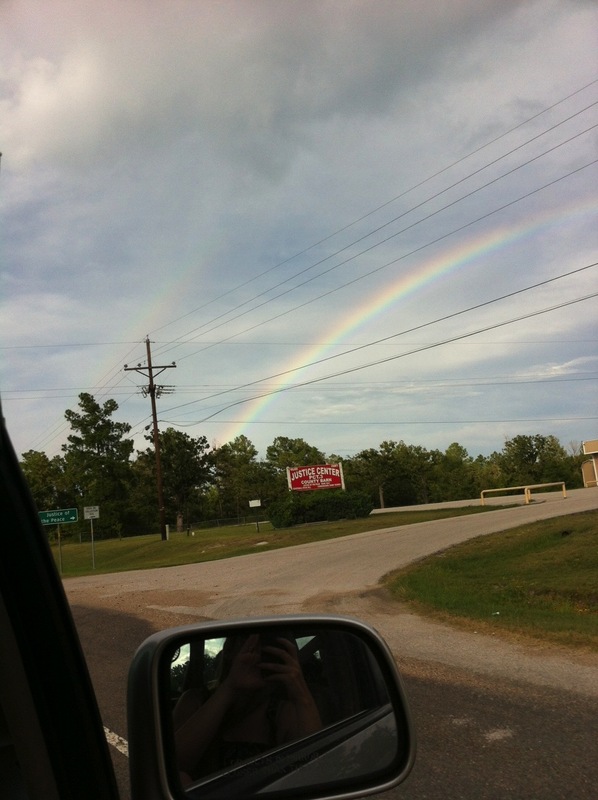 We are generally only able to see part of a rainbow, but there I was staring at a full double rainbow. 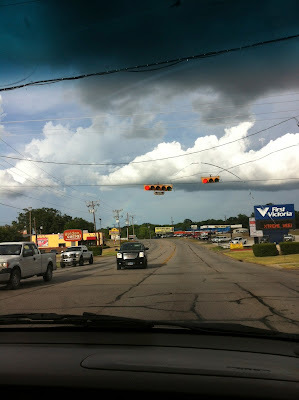 The windows were down with summer rain drifting in. I forgot about everything else and delighted in God with what he allowed us to see. Nothing else compares to the glory of Christ.